This past weekend when shopping with Samii and Clarkson (it was the same day the unfortunate problems occurred with Best Buy) I purchased and tried some hot chocolate that was really weird. Created by a brand known as the, "Redneck Cafe," which is a part of the store we bought it at (World Market) the drink was bacon hot chocolate. I'll get one thing out the way--it wasn't good--but it was interesting. When I drank it I heated up some water and poured in the mix which looked perfectly normal. There was a slight artificial bacon-smell which only intensified as I mixed-in the powder. I eventually took a sip and it tasted like a decent hot chocolate...followed by the nastiest fake-bacon aftertaste one could imagine. 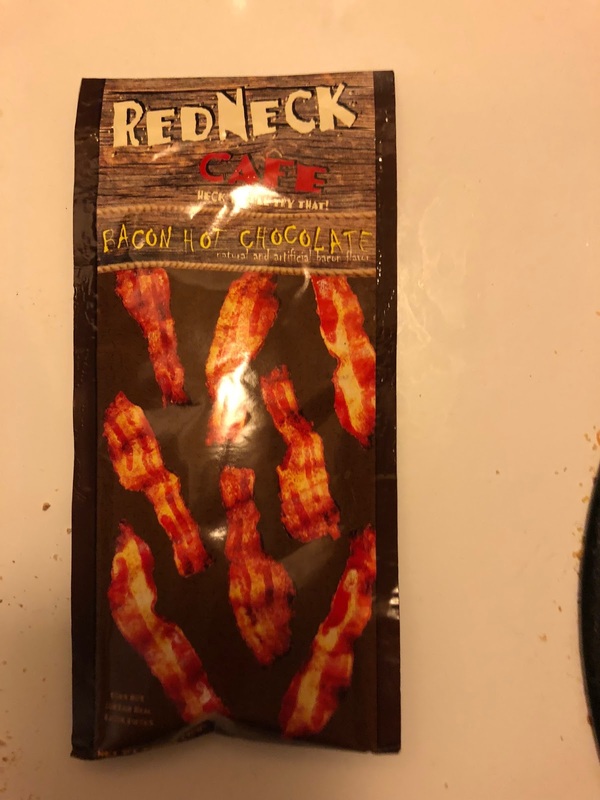 It didn't make me feel sick, it just struck me as having more of a chemical-taste reminiscent of bacon than actually feeling like hot chocolate with bacon in fact mixed into it somehow. Still, it was a fun little thing to try as I am someone who loves hot chocolate as well as of course coffee (but I don't really like them together AKA as a mocha, go figure). I maybe didn't like bacon hot chocoalte, but I did like the combination of cola and orange juice in a drink I bought, so live and learn.